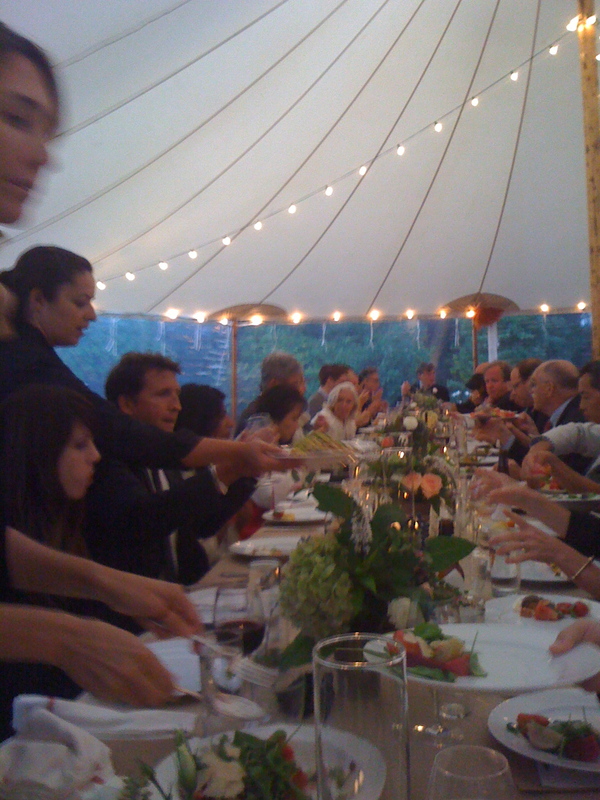 Some said it was like being in a Chekhov play: two days on an island in a big red barn with fourteen people, some of us strangers to one another, some old friends and lovers, in town to attend the wedding of two dear friends. The weather was warm and sunny during the day, foggy and damp at night; there was a big lawn for playing croquet; old German cars were strewn about; characters paced and smoked alone in the yard; a big kitchen provided opportunity to bump into people early in the morning, late at night. Main characters included architects, a writer, an actor, mathematician, photographer, doctor. Secondary in the cast of characters were an irate local property manager, a David Lynch-esque grumpy cashier, a housekeeper whose scratchy voice betrayed years of smoking. 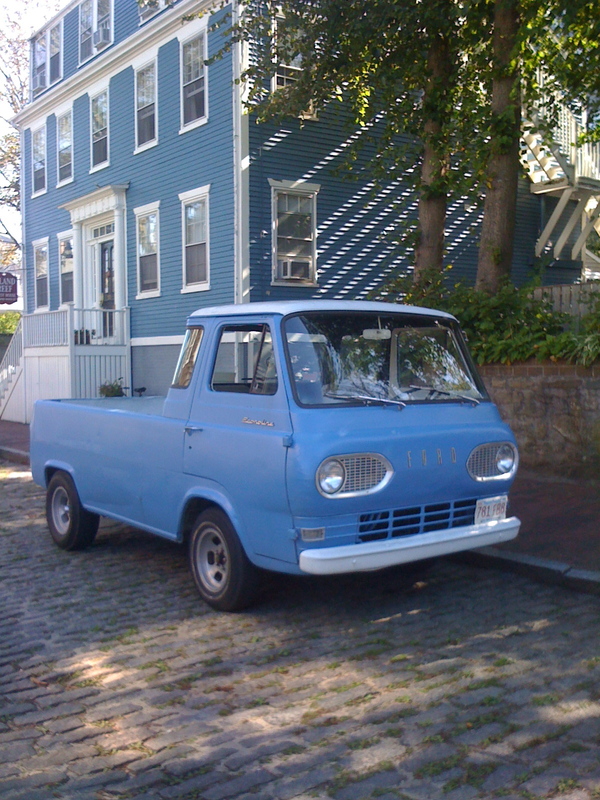 And then there’s Nantucket: a character unto itself. Stately and charming, it can intimidate while pretending to welcome. At least, it can come off that way to a group of New Yorkers that included Jews, Indians, Japanese, Mexicans, Chinese, and Koreans. 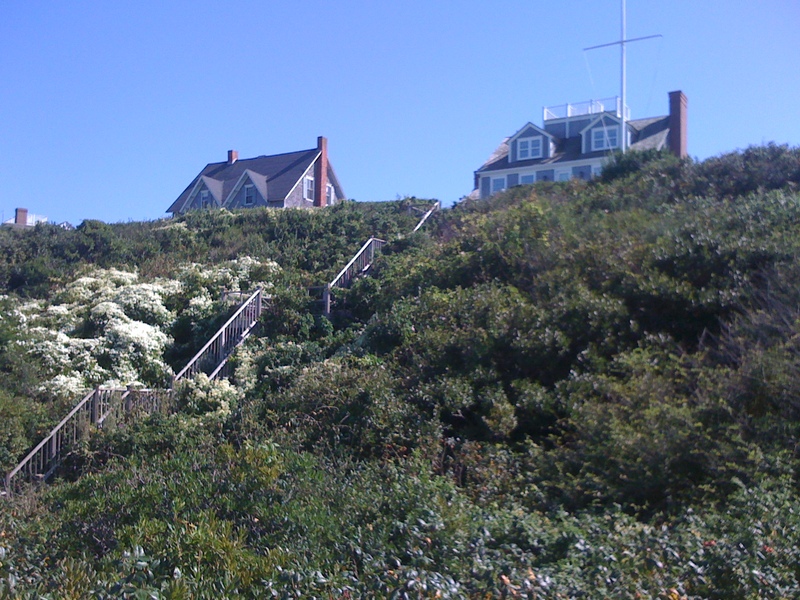 We were the most diversity on the island since the Wampanoag Indians were forced out by the English in 1641. But I digress. The wedding was a beautiful, artful celebration of two dear friends, very much in love, surrounded by loving friends and family. We danced into the wee hours until I’d developed a shin splint; we ate suckling pig, local cod, end-of-summer tomatoes and corn; fingerling potatoes roasted in duck confit, and vanilla, chocolate, and carrot wedding cupcakes. (Chef Michael LaScola of the island’s beloved American Seasons restaurant catered the event.) The Tempranillo and Grüner veltliner flowed freely. Our friend Amy manned a photo booth in the cabana, where the guests came in to have their photos taken with fake moustaches and other found props. The photos were coming out great – hopefully I can get my hands on a few and post them. Many of the other photos I took are on my other camera, so perhaps I can post some of those later too. 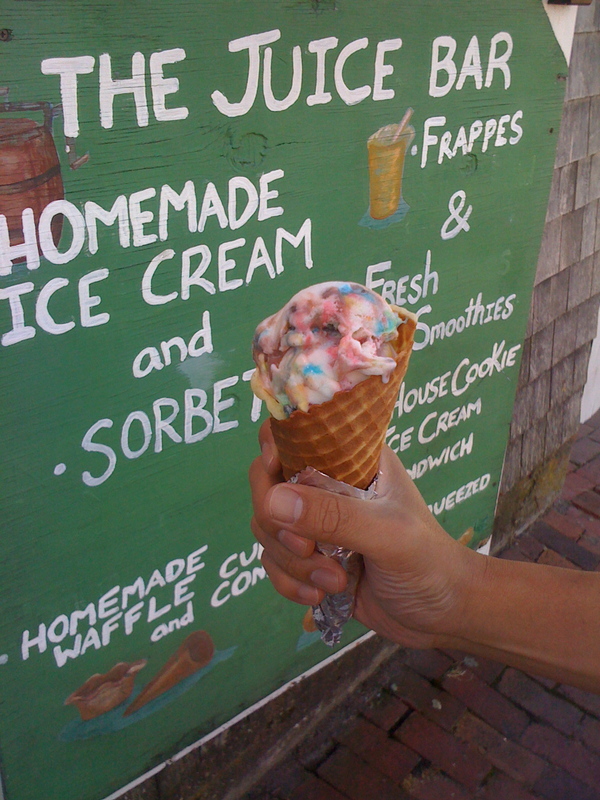 The photo of the ice cream cone at the top is from the famous Juice Bar on Broad Street, serving homemade ice cream, waffle cones, and fresh juices. The kid who scooped this couldn’t have been more than twelve, but he was fast. I’d never had mint-M&M ice cream before but now I understand what the long lines are about at this place. 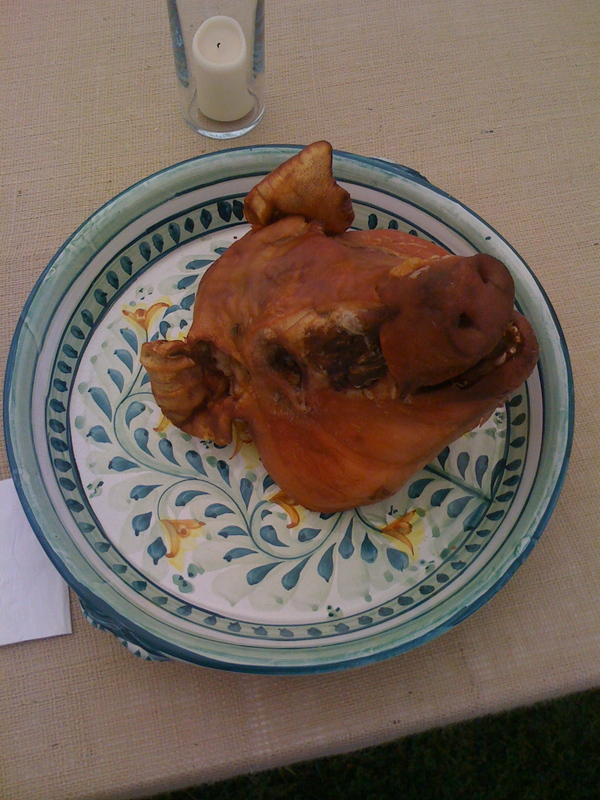 Here’s the head of one of the two suckling pigs served at the dinner. Of course, this became one of the props in the photo booth. I’m going to apologize in advance to Peta, and my vegan and vegetarian friends. Before leaving on Sunday we had a few hours to kill at Steps Beach, a close walk from the Chekhovian red barn where we stayed. 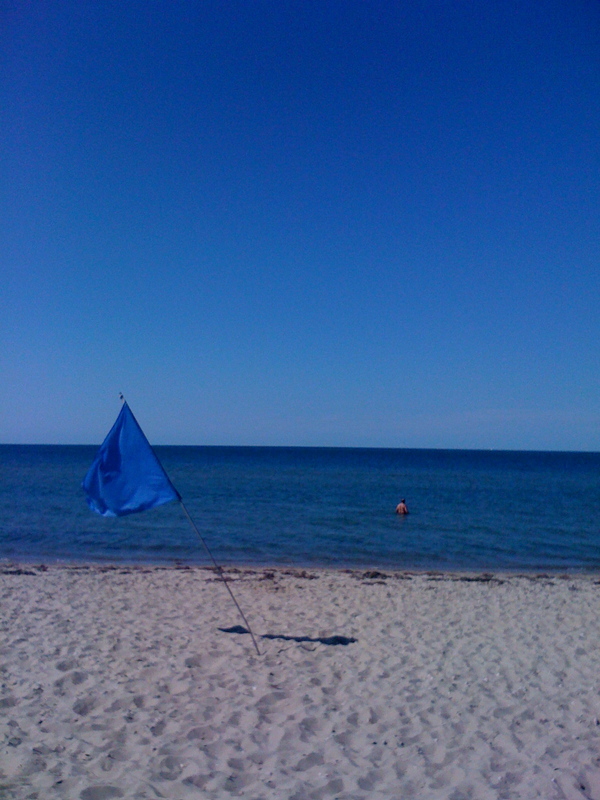 It was a gorgeous, bright, blue, sunny day, the eleventh of September.